The day started at 8am with a 3-hour chef’s demo. Big binders were handed out containing course materials for the 11 weeks of Basic Cuisine. Following a review of the curriculum chef took us through the contents of our knife cases. Woot! Apparently the knife set is worth £800. Blimey. The study routine is a 3-hour chef’s demo followed by a 3-hour practical in the kitchen, barring theory and technical sessions like food safety. During Basic Cuisine and Intermediate Cuisine we are to reproduce exactly what chef shows us in the demo. 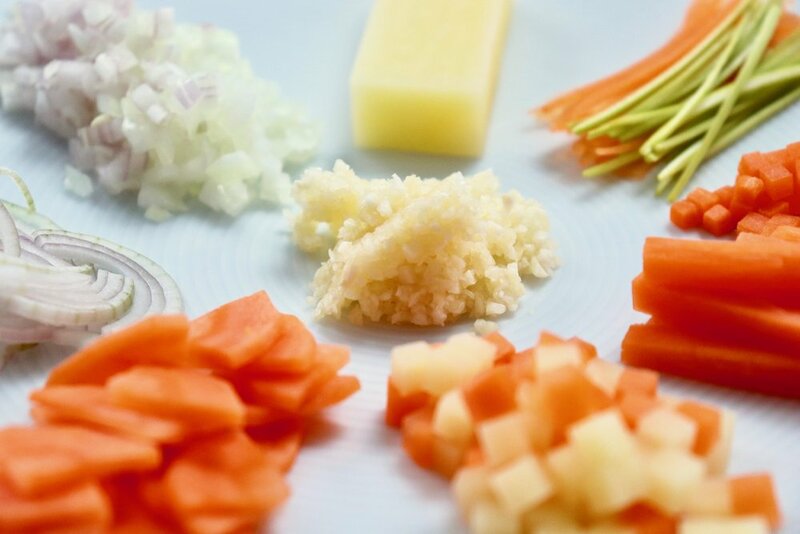 The first lesson was all about classic vegetable cuts and knife skills, with emphasis on technique over speed. It started with washing and peeling. Perfect rectangle with size according to need. Under chef’s watchful eye we had to execute kitchen protocol including logging fridge temperatures and stock taking, organise our workstations, follow a left-to-right workflow (for us right-handers), separate trimmings, and clean down between tasks. Knife in hand it was time to create a Block. Nothing fancy you’d think. Just cut a perfect rectangle from a suitable vegetable. 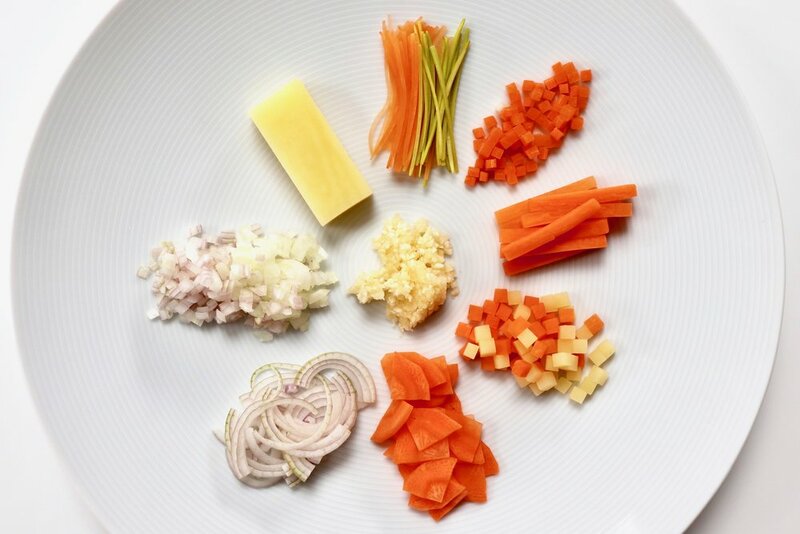 Block is the foundation for Julienne, Brunoise, Bâttonet and Macédoine. Let me tell you, cutting a perfect rectangle out of a spud ain’t easy. We all managed to whittle baking potatoes down to chipsticks without getting all the angles at 90 degrees. Give it a try if you don’t believe me. From a block we cut what are called planks, from which we produced 1mm thick Juliennes, 3mm cubes or Brunoise, 5mm batons or Bâttonet, and 5mm cubes or Macédoine. We had to use rulers for accuracy. Get your block wrong and you’ve got no chance. Slicing into Paysanne, meaning peasant, and Émincé were easier. Dicing to Ciselé too. This is where we were taught how to hold and finely dice an onion and shallot. There were no blood injuries. I suspect they’ll come later when we get cocky. A few fingernails got shaved though. Did you know you’re meant to remove the germ from the centre of a garlic clove? That’s the bit that eventually sprouts. It’s the harshest part and is responsible for garlic breath. 30 minutes before the end we had to self-assess then present our plates to chef. Here’s what I put up. Chef merrily picked his way through my plate with his cocktail stick. There was no hiding my wonky block. He seemed to like that term, adopting it for other classmates. Apparently my slicing and dicing were good. Some julienne were too big. A few irregular bâtonnet. We finished in the kitchen at 1:50pm. It felt like 5pm. Pooped. An hour to kill before a lecture on health and safety. I have the day off tomorrow. You just know I’ll be whittling more potatoes.